Like its predecessors, this fourth edition of Japanese Americans and World War II is intended as a succinct and affordable supplement to history and political science texts that minimize or neglect the Nikkei (Japanese American) experience in World War II. As was hoped, the first two editions of this publication found an enthusiastic reception by instructors and students alike at the high school, community college, and university level. 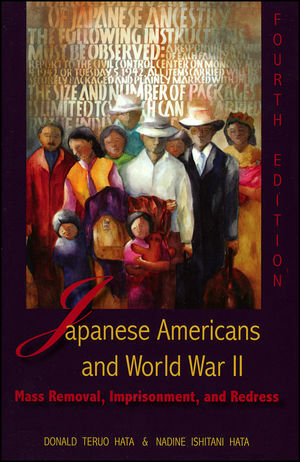 In addition, the expanded third edition found a new readership beyond the classroom, in members of and visitors to museums, such as the Japanese American Museum in Los Angeles, and interpretive centers at former concentration camp sites administered by the National Park Service at Manzanar, Tule Lake, and others (some in progress). In response to the supportive and constructive feedback of students, instructors, and lay readers, we at Harlan Davidson undertook a bold and sweeping redesign of the third edition that saw our well-loved little “pamphlet” become an attractive but still highly affordable book that, in addition to taking the narrative completely up to date, has been thoroughly re-edited and expanded further to include photographs, key documents, and an enhanced multidisciplinary bibliography of 200 core publications by historians, political scientists, sociologists, anthropologists, and others, as well as multimedia and Internet-based sources. Inaccurate and misleading euphemisms such as “evacuation” and “internment” have been meticulously replaced with more accurate terms like “mass removal” and “imprisonment—changes explained and amplified in a new “Note on Terminology,” which explains the movement to correct long out-dated language and refers readers to thoughtful essays on the subject by eminent scholars. Nadine Ishitani Hata was emeritus professor of history and emeritus vice president for Academic Affairs at El Camino College in Torrance, California. She served two terms on the California State Historical Resources Commission – when Mazanar and Tule Lake concentration camps received historic site status, vice chair of the California State Advisory Committee to the U.S. Commission on the Civil Rights, and was elected to the governing boards of the American Historical Association and the Los Angeles Conservancy. Born in 1941 and raised in Honolulu, Hawaii, she died in 2005 of metastasized breast cancer. Donald Teruo Hata is emeritus professor of history at California State University Dominguez Hills and recipient of the CSU Trustees Systemwide Outstanding Professor Award. He served as planning commissioner and city councilman in Gardena, California, on the governing boards of the California Historical Society of and the Historical Society of Southern California, and as an elected officer of the American Historical Association. He was born in 1939in East Los Angeles and incarcerated at the age of three in the U.S. War Relocation Authority concentration camp at Gila River, AZ during World War II.